Lassi is Kefalonia’s oldest and most established resort town and an ideal place to base yourself to explore the rest of the island. 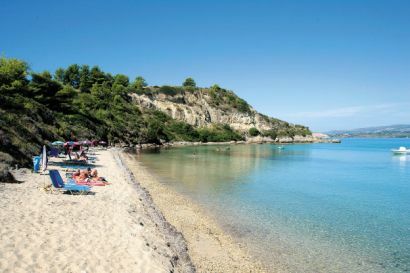 This fantstic resort is only three kilometers away from the capital of the island, Argostoli and has been attracting visitors for more than twenty years thanks to its spectacular views out over the Lixouri peninsular. 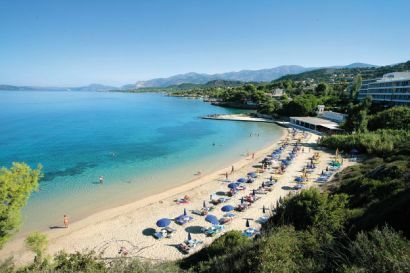 Nowadays that peninsular has been developed considerably more than other parts of the island so if you are looking for a tranquil and mellow Kefalonia resort you might want to think about looking elsewhere. 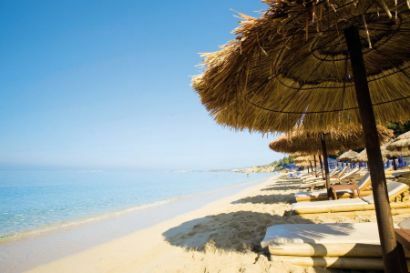 If however you are looking for all the usual elements of a traditional Greek holiday – great beaches, crystal blue sea, water parks and watersports, endless bars, tavernas as well as a wide range of eateries – then Lassi is ideal. Only minutes away from the airport, Lassi is perfect if you want to jump on a plane and be out on your sunbed a few hours later. 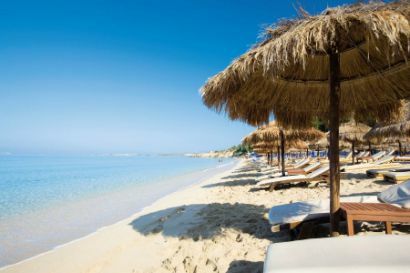 There’s no denying Lassi can get very busy in high season – but this is because the resort is home to one of the finest sandy beaches in Kefalonia and a selection of large and modern hotels that look out over the peninsular. Most of these hotels (such as the Plati Yialos and Makris Yialos or The White Rocks) are only minutes from the soft white sand and afford visitors the pleasure of sunset walks barefoot along the waters edge, taking in the incredible scenery (photographers will find those sunsets irresistible) and stopping off at any of the small tavernas or traditional local restaurants that take your fancy. 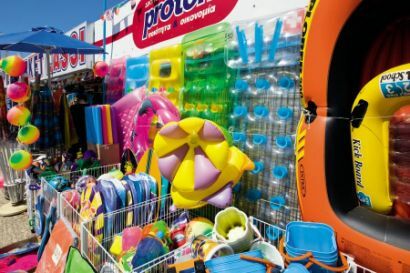 In addition to the main beach there are a couple of other long beaches offering all the usual watersports and holiday activities as well as some quiet and peaceful coves if you want to get away from the crowds and noise. With a number of popular mini-markets and handicraft fairs as well as traditional local shops, Lassi is a resort that has everything you will need and will perfectly suit those of you looking for a relaxing family holiday. When deciding on Lassi it is worth checking on the location of your hotel as the resort is filled with accommodation, some of it close to the sea and some of it further back tucked away in cool shaded streets behind old palm trees or higher up in the hills. If you are looking for a lazy holiday or are not particularly disposed to enjoying walking up steep roads then you’ll want to make sure your hotel is not in the hills! Lassi does offer other the opportunity to see some of the local sights too. 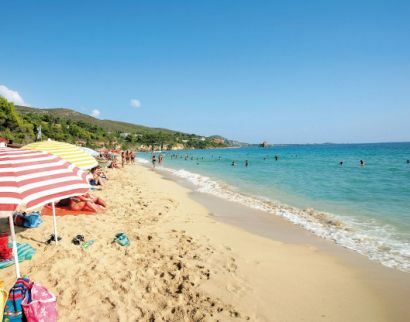 Its proximity to Argostoli make sit the perfect base from which to hire a car and see the rest of the island and on the outskirts of the resort there are a wide range of pristine and empty sandy beaches that are easily reachable by car. It also has a number of local attractions within the resort itself, such as the cave of St Gerasimos (St Gerasimos is the patron saint of Kefalonia). The cave is where Gerasimos lived for five years when he first arrived on the island and there is now a charming old church next to the cave dedicated to him, the Church of Odos Spiliou Agios Gerasimou. For budding photographers this is a great spot to get some wonderful pictures, not just of the local landscape, but also of the wonderful caves and church. The insides of the church are elegant and ornate, filled with gentle paintings and icons and well worth spending time visiting. Lassi may be the main resort on Kefalonia, but it has managed to do this whilst retaining some of its traditional charm and remaining relatively low-key, in spite of all the recent development. Choose the right hotel and you will find yourself and your family coming back again and again.